The European summer is still here and one of the favorite pass times is the barbeque. 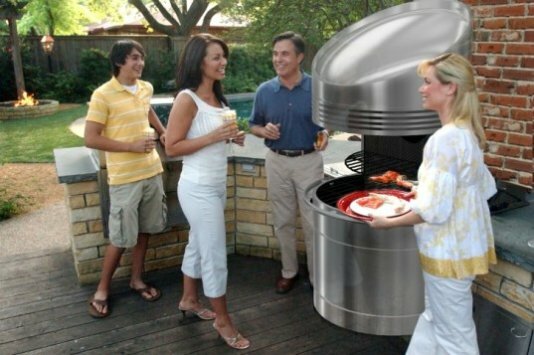 However, grilling is certainly not one of our most environmentally friendly technologies. Whether you prefer charcoal, wood chips or propane, grilling releases emissions and contributes to poor air quality. Up until now, solar powered grilling has required, as you might expect, the sun, which means traditional fuel-fired grills are required after sunset. But new solar technology developed by MIT professor David Wilson could bring a nighttime solar-powered grill to the market very soon; an invention also of great benefit to those in developing nations who rely on wood to cook all their food. Wilson’s technology harnesses the sun and stores latent heat to allow cooking times for up to an amazing twenty five hours at temperatures above 230 degrees Celsius. The technology uses a Fresnel lens to harness the sun’s energy to melt down a container of Lithium Nitrate. The Lithium Nitrate acts as a battery storing thermal energy for 25 hours at a time. The heat is then released as convection for outdoor cooking. And if you are looking for more reasons to switch to solar grills, then a new study will certainly provide you with them. Findings from the American Journal of Clinical Nutrition confirmed the link between heterocyclic amines (HCAs), a carcinogen found in grilled meat and fish, with a higher risk of breast, stomach, pancreatic, and colorectal cancer. HCAs form in meats and fish cooked at high temperatures when amino acids and creatine (a chemical in muscle) react. Another nasty culprit, PAHs (polycyclic aromatic hydrocarbons) form when fat drips off the meat into the flame or heating element. PAHs rise in the smoke and deposit on the food. Yeah, lots of delicious stuff is bad for us, but can be avoided with solar grilling.